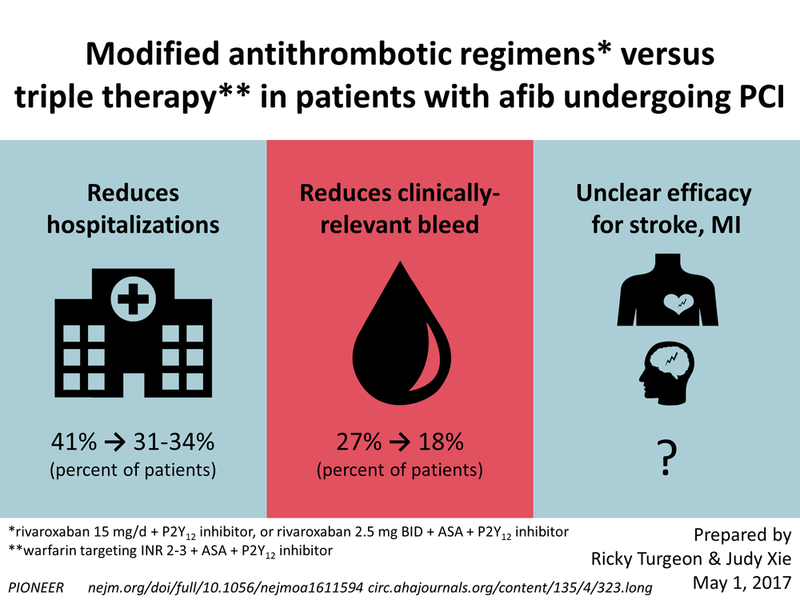 Bottom line: In patients with AF undergoing PCI, a novel antithrombotic regimen (reduced-dose rivaroxaban + P2Y12 inhibitor, or ATLAS trial-like triple therapy regimen) reduces the risk of hospitalization, bleeding requiring medical attention and study discontinuation (NNT ~10-15 each). This trial does not answer whether these novel regimens retain stroke efficacy for AF (either regimen versus full anticoagulation) or MI/stent thrombosis efficacy for CAD (modified double therapy versus DAPT). While ongoing trials will provide further guidance on the ideal regimen and dose, the best available evidence suggests that dual therapy with clopidogrel plus full-dose anticoagulation provides the best balance of benefit and safety. "Any other condition known to increase bleed risk"
Represents the target population at the time when the decision on antithrombotics would be made. Due to their higher risk of MI, stent thrombosis & CV death, thes benefit-risk profile of different antithrombotic regimens (& DAPT duration) likely differs in this subgroup. This trial is underpowered to evaluate this subgroup. ~90% of patients had a CHA2DS2-VASc of 2 or more, corresponding to a risk of stroke or systemic thromboembolism of >1.5%/year & indication for anticoagulation by all major guidelines (AHA, CCS, ESC). The bleeding rates in this trial therefore represent a minimum risk that would be expected to increase substantially in the presence of any of these risk factors. Rivaroxaban dose 25% of the 20 mg/d dose determined to be non-inferior to warfarin in ROCKET-AF trial. There is no prior evidence suggesting that this dose is adequate to reduce the risk of stroke in AF, nor is there evidence that adding DAPT to this reduced dose will reduce the risk of ischemic stroke. The open-label WOEST trial randomized 573 patients undergoing PCI with an indication for OAC to either double therapy (clopidogrel + warfarin to target INR 2.0-3.0) or triple therapy (clopidogrel + ASA + warfarin). Notably, only ~1/3 of patients underwent PCI for MI, & only ~70% took an OAC for AF. At a median 1 year, double therapy had a lower risk of any bleeding (19% vs 44%, NNT 4) and death (2.5% vs 6.3%, NNT 27). The differences in major bleeding (3.2% vs 5.6%) and stent thrombosis (1.4% vs 3.2%) were not statistically significant. Bottom line: Lower risk of any bleed & death; No statistically significant difference in major bleeding or other outcomes. The open-label ISAR-TRIPLE randomized 614 patients undergoing PCI with drug-eluting stent who were taking OAC for at least 1 year to either 6 weeks or 6 months of clopidogrel (added to ASA + OAC). ACS was the indication for <20% of stent placements, and AF was the indication for OAC in ~85% of patients. There was no statistically significant difference in the primary outcome of death, MI, stent thrombosis, stroke or major bleeding from week 6 to month 9 (6-week 4.6%, 6-month 6.4%). There were also no statistically significant differences in CV endpoints of CV death, MI, stent thrombosis or ischemic stroke (6-week 1.4% vs 6-month 3.4%) or major bleeding (2.4% in both groups). The only statistically significant difference was a lower risk of any bleeding (BARC definitions; 20.5% vs 27.9%, NNT 14) with the shorter course of clopidogrel. Bottom line: Lower risk of any bleeding; No statistically significant difference in major bleeding or other outcomes. Could not rule out a 3-fold increased risk of stroke in the double therapy/ATLAS regimen versus triple therapy. Contrary to WOEST, PIONEER did not demonstrate a lower risk of death with the modified double therapy regimen vs triple therapy. Due to the low number of events, either finding could be due to chance (false-negative in PIONEER or false-positive in WOEST). The risk of major hemorrhage over 1 year with triple therapy (3.3%) was comparable to that in the ISAR-TRIPLE trial (2.4% at 9 months), & substantially lower than in the Danish registry (12.2%) and the WOEST trial (5.6%).